Barton Turf Adventure Centre01692 536411work Outdoor Pursuits CentreRun by Ash Cato and Sheila and Simon Fishwick, BTAC is the premier RYA-recognised dinghy sailing school on the Broads. Formerly the Herts Outdoor Education Centre, now it is open to everybody from 8 to 80 (and beyond!) to come and learn to sail, canoe, or handle powerboats (12+ yrs), or simply to spend time enjoying the water under the guidance of our fully-qualified instructors. In term-time we are open at weekends; during school holidays we offer courses on weekdays as well. Dates of scheduled courses are on our website www.btac-services.co.uk, but we can also arrange a course to suit you if we can fit it in to our busy programme. If you don't want to commit to a full course, we offer come-and-try sessions (dinghy sailing and canoeing) usually a couple of hours on Saturday mornings. Note: You do need to pre-book to be sure of a place on any of our activities. We also can offer things like improvised rafting sessions which make an excellent basis for children's parties (8+ years old), office team-building, or even a stag- or hen-event! 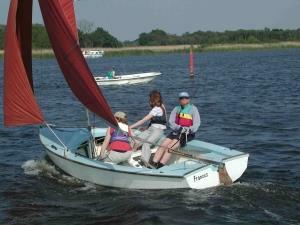 Run by Ash Cato and Sheila and Simon Fishwick, BTAC is the premier RYA-recognised dinghy sailing school on the Broads. Formerly the Herts Outdoor Education Centre, now it is open to everybody from 8 to 80 (and beyond!) to come and learn to sail, canoe, or handle powerboats (12+ yrs), or simply to spend time enjoying the water under the guidance of our fully-qualified instructors. We especially welcome schools, clubs and youth groups. We offer access to a range of adventurous (chiefly water sports) and environmental activities using Barton Broad and our 14-acre private nature reserve. As well as day-visits, we can also provide schools with fully-catered accommodation in tents, enabling longer visits, and more opportunities to bring outdoor learning into your curriculum. AALA licensed. OS Map Ref TG356225. From Norwich, take A1151 through Wroxham & Hoveton. 2 miles after leaving Hoveton, turn right onto an unclassified road signed Neatishead & Barton Turf. Go through Neatishead (beware: blind double bends!) over bridge & take 1st turn right (Hall Rd), signed Barton Turf. On reaching Barton Turf, fork right beside green, signed "Staithe" & continue straight down Staithe Rd. The Barton Turf Adventure Centre Sailing Base is on left, behind a pair of double farm gates, about 75yds past Bittern Crescent. If approaching from the Northeast (Cromer, Holt, Stalham, Cats Common) follow the sign to Barton Turf & Pennygate however these roads are single track & too narrow for wide vehicles to negotiate easily.